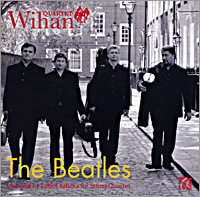 "..one of the world’s most refined string quartets playing Beatles ....... the Wihan Quartet treat each phrase with the respect they would accord to an unexploded piece of thorny Ferneyhough. It’s great music, superbly played. What more can we ask?" To continue browsing while playing music samples, please right click mouse and choose Open in New Window to start with.